The spring planting season is currently in full effect and for the many avid gardeners out there you may have already started the garden planning process. 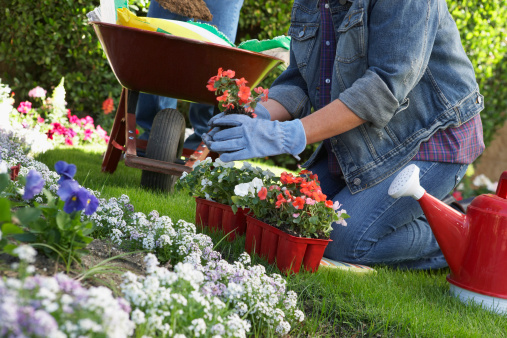 Proper gardening can help improve the atmosphere of any backyard or business front. Here in Massachusetts, we are considered to be located in an area known as Plant Hardiness Zone 6. This zone system ranges from 1-13 and helps to determine which plants will be more likely to thrive in certain areas of the United States based on weather conditions and the terrain. As you may know, certain plants cannot grow without having the right living conditions so being aware of the zone you live in is essential when choosing what to plant. Luckily for New Englanders, there are a large variety of plants that can flourish in Zone 6 ranging from trees, flowers, and even shrubs. While spring is known as the ideal time to start planting, Zone 6 offers a longer growing period than many zones, which means that you’re never too late to start planting something! After the last frost of the winter season gardeners should start to consider what to plant in their gardens for the upcoming spring and summer months. During these months, many trees, flowers, and shrubs can be planted in Zone 6. One option available to gardeners that will be sure to turn heads are annual flowers. These flowers tend to blossom with large amounts of colors, but are unable to withstand the cold. Some examples of beautiful annuals that will thrive in Zone 6 include Annual Vinca, Bush Morning Glory, Cosmos, and Pansies. Remember, an annual flower will only last one growing season so the sooner you are able to plant them and have them bloom, the longer they will be able to liven up your garden. Spring and summer is also a great time to plant anything that will need to establish large roots to withstand the harsh winter months. Prime examples of these types of plants include newly forming trees and shrubs. Some trees to consider planting in Zone 6 include Maple, Oak, Crabtree, and even Japanese Cherry Blossoms. While some shrubs include Forsythia, Honeysuckle, Hydrangeas, and Rhododendron. Planting later in the growing season provides advantages for the next growing season. Although you will most likely not be able to see your plants bloom at first, you are setting them up for success next season. Typically perennials should be planted during this time as they will be able to grow back after a cold winter. Unlike annuals, a perennial has the ability to keep its root system alive even if the ground is covered in snow. By planting a perennial in the summer or fall you are ensuring that come next spring, they will be able to blossom. Some commonly planted Zone 6 perennials include Amsonia, Daisies, Violets, Hostas, and Clemantis plants. Aside from perennials, it is still possible to plant annual plants later in the season, just keep in mind that they will not grow back like a perennial will the following season. Late summer and fall is a good time to prep your garden for the winter months to come. By laying down new compost and maintaining your garden you are taking the necessary steps to make sure your perennials will bloom once again next spring. As a professional landscaping service, Greener Horizon recognizes the importance of creating an aesthetically pleasing environment for both home and business owners. If you are searching for a high quality plant installation provider we are here to help! We possess the tools and skills needed turn your garden into a beautiful work of art. If you wish to set up a consultation or have any questions about the services we provide feel free to contact us.